The first article in this post, covering the dedication itself, took up two of the seven columns on the front page of the paper and another column and a quarter inside. A great day, indeed! Very few events in Homestead rated this magnitude of coverage. The article even includes much of President Lasdusky’s speech, which is very similar to what was reprinted in The Homestead Press (but not exact, which makes me think that reporters took notes in short-hand as he spoke?). The remainder of the articles show that the lead-up to the dedication day also received extension coverage in many area papers, probably more than I’ve included here so far. There was even the completion of a Torah, just as there was at the time the congregation formed! There is a lovely quote at the end of Lasdusky’s speech which captures my feelings on discovering so much positive coverage of our community. He says, “We have proof tonight with what respect and with what esteem the Hebrews of Homestead are held by our Gentile friends and neighbors, for looking about and seeing them honoring us with their presence at our table willing to break bread with us, thereby showing that we have their well wishes while we celebrate the dedication of our new synagogue.” Even more remarkable is that so many turned out… on Easter! The had celebrated Purim just the previous Sunday in the new synagogue, and Passover was still a few weeks ago, so who knows why they picked that date (although it does not seem to have held back attendance… what do I know about how people observe Easter?!). Giant front page article in The News-Messenger on 3/31/1902! 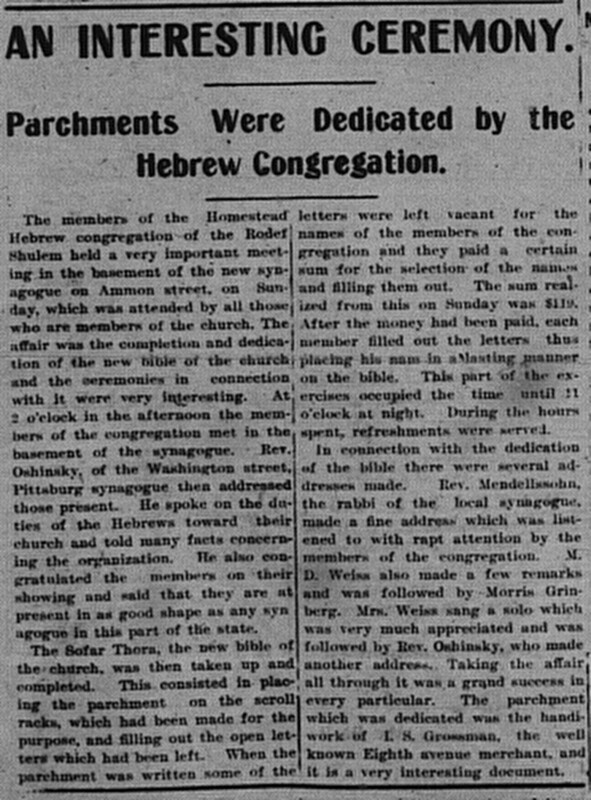 Yesterday was a memorable day to the Hebrews of Homestead, who met and dedicated their cozy little synagogue on Ammon street, then celebrated the event by a banquet in the Fifth avenue opera house, which was attended by all the Jewish families of the town along with many of the more prominent Gentiles. The dedicatory exercises which took place in the afternoon, while very solemn and impressive yet at the same time most interesting, being entirely unlike any dedication of a house of worship ever before held in this place, one notable feature being the participating in the exercises by people of all denominations, Protestents (sic), Catholics and Hebrews alike take part and delivering addresses, something unusual anywhere. Chas. Frankel then lit the seven altar lights along with the perpetual light over the altar and the choir sung “How Goodly are Thy Tents, O Jacob.” 2 Rabbi A.M. Ashinsky, of Pittsburg, then delivered the dedicatory address in German, the services being Orthodox every one sitting with their hats on all through the exercises. Joseph Lasdusky, president of the congregation and B. Hepps, vice president then entered with the Saphorim (Scrolls of Law) and the congregation responded to the reading after which the bearers made a circuit of the synagogue and the saphorim was deposited in the ark. Rev. Fried, an eloquent speaker from the city, then delivered an address and after the singing of a hymn “Halleluja! Praise the Lord, Praise God in His Sanctuary,” 3 addresses were made by Burgess J.C. Miller 4, Hon. John F. Cox, and A.C. Stein. All the speakers praised the congregation for what they had accomplished and paid glowing tributes to the Hebrews at citizens. Special prayer for the President of the United States by Rev. Fried, after which the closing address and benediction was delivered by Rabbi Ashinsky, in English, and the congregation was dismissed at 6:30, three hours and a half being consumed by the exercises. The synagogue is a cozy little house of worship with a seating capacity of over 200. It is nicely arranged and artistically finished and contains many stained glass windows, which gives the interior a nice effect. Underneath the church are two rooms, one used as a meeting room by the congregation and the other for a school room. The school room is fitted out with regulation desk and the children of the members of the congregation meet there every afternoon after the public schools are dismissed and are taught by the Rabbi. The building and grounds cost about $8,000 and was a big undertaking for a congregation which at one time only numbered 10 families and at the present time only numbers 48, and the fact that there only remains a few hundred dollars to pay on the property shows how hard they must have labored and the sacrifices they have made. This is a remarkable showing by such a small congregation and it is doubtful if it can be equaled anywhere. Among the donations made to the congregation out of contributions to the building fund is a plush portier for the front of the ark 5 it being handy work of Mrs. Joseph Lasdusky and Mrs. Weisburg. It is a most beautiful and artistic piece of work and must have cost the ladies many hours of labor and no little money for the material. Other donations are a white cover for the ark presented by M.D. Wies, of Heisel street, the perpetual light by Louis Glick, of Heisel street, chandelier of seven lights for the pulpit 6 by Mrs. M. Frankel of Heisel street, a cover for the scrolls, made by Mrs. B. Hepps, I.L. Grossman and Mrs. Eskovitz, cover for pulpit, presented by Miss Belle Haupt and Miss Laura Glick. 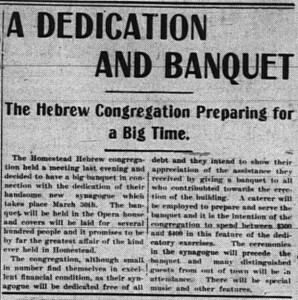 “As president of the congregation, which is holding this banquet I will confine myself to the object of our congregation, the work accomplished by its members and briefly the history of our congregation previous to 1894 when we organized all the Israel lits (sic) of this town were isolated from one another, they had no social companionship, no organization, strangers in a strange country, the resignation among our worthy Gentile friends seemed very limited. “They had the desire but not the power to raise up socially, they were estranged among themselves but not with their God. I have already said previous to 1894 the Jews of Homestead were estranged and seemingly asleep but when the New Year and day of atonement was approaching their loyalty to their faith awoke and through the kindness of the Second ward fire company, who placed their rooms at the disposal of the few Jews who wished to congregate to worship their Creator, and their (sic) they observed for the first time in Homestead the days that are the most sacred in the Hebrew calandar (sic). Ladies and gentlemen that was the infancy of our present matured congregation as it is necessary for all who wish to accomplished (sic) something to know first what desire and needs are. March 9, 1889 article from The Homestead News with a picture and biography of L.L. Davis (click to enlarge). He was burgess of Homestead when this article was written! We have proof tonight that the Homestead Jews then understood what their desire and needs were. But they being then only in their infancy and few in number, they had to creep before they could walk. We organized and appealed to the governor of our state for a charter, which was granted to us by the aid of our worthy friend, L. L. Davis. The name we chose for our congregation is Rodef Scholem. The defination (sic) is Lollow (sic) Peace. When we organized we had 18 members and three years later found our congregation dwindled to about 10 members and no necessity of electing a treasure. The pleasure which these remaining 10 members ought to have here tonight, seeing the accomplishment of their faithfulness in such a glorious manner is easier to surmise than for me to describe, and it is to their credit for keeping up this congregation that made it possible for the graeter (sic) work which has been done when members again came to our folds. The year of 1900 found us with a membership of 20 and already necessary to elect a treasurer for we had $1,000 to take care of. Then we held services and sent our children to be taught in the Hebrew religion in a small dwelling room. So we started anew with a will and with the ambitious objects to build a synagogue that should be a comfortable home for our religion and should be not only a credit to ourselves but to our town as well. Ladies and gentlemen, we succeeded and our desire is fulfilled with gratification, and now I, as president, wish to thank the members individually for the noble work they accomplished. With what liberality they gave that which assured us of the success of the undertaking, with willingness they extended their aid was a pleasure to behold. I wish to extend the thanks of the congregation and the praise of myself to one who never tired of his undertaking which indeed was much. One who was always willing to give his time to see that the work was progressing, one who proved himself a giant to our cause. He, my friends is the kind of member we have placed as worthy chairman of our building and dedication committee an he is also our worthy vice president, Barnard (sic) Hepps. We had, as I already said, grown to 20 members in 1900 and now we are a membership of 42, nearly all the Jewish residents of our town being on our rolls. 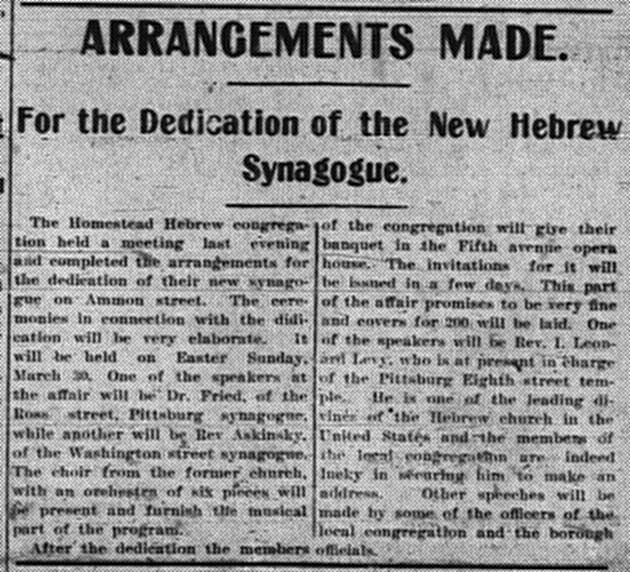 We also claim members in Duquesne, and found an aid in Braddock, Mrs. Weisburg, who has Homestead at heart to such an extent that she spent much of her time in working on the gift that will enrich our new synagogue. Our present financial condition is a net capital of $7,000. And thanks are due to the aid extended to us in the last year by prominent citizens of Pittsburg and elsewhere. And I assure you the Gentile friends of our own town are numerous on our contribution list and their names will always be remembered by our congregation with gratitude. We now have a Hebrew school in our synagogue which is conducted by our worthy Rev. Mendelsohn, where all the Jewish children attend after public school hours. My friends, as you already know the proud name of our congregation being R.S. and its defination (sic) is to Follow Peace, we also have adopted as our motto, How good and how pleasant it is when Brothers congregate with Unity 7 in thought, and Unity in action for the promotion of good, How well we lived under this Banner since we organized we can safely leave to the decision of the good citizens of our town and we can say with pride that their verdict must be such that would make any presiding officer proud of his members. Mr. Lasdusky closed by proposing a toast to the guests of the congregation at the banquet, which was drunk by all the members of the congregation, after which Dr. Purman suggested a toast for the congregation on the part of the guests which was also heartily responded to. B. Hepps then took the floor and made a few remarks in which he stated that it was Mr. Lasdusky and not he to whom most of the credit for the erection of the new house of worship belonged and paid a glowing tribute to the latter. It was after 10 o’clock when the banquet ended and the guests and members of the congregation departed for their homes, each extending congratulations to each other. Sam Markovitz, I.S.Gross, A. Hepps, M. Fogel, Sam Hepps, Max Markovitz, H. Moskovitz, S. Grinberg, Jos. Fried, B. Friedlander, B. Gluck, M. Grinberg, Sam Mervis, I.J. Goldstone, A. Marcus, J. Miller, M. Lefkovitz, S. Ferderber, Louis Beck, Philip Cohn, M. Devay, L. Gluck, N. Eskovitz, H. Pollock, Em. Shwartz, Mike Weiss, I. Fogel, J. Brichta, Nathan Shwartz, I. Pruger, R. Shermer, L. Lefkovitz, I. Gluck, I. Fox, M. Fishel, M.D. Weiss, I. Grossman. 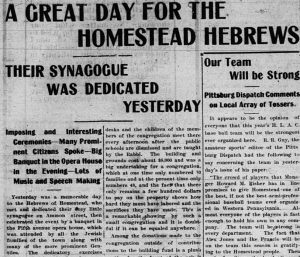 There were a number of articles in the Homestead and Pittsburgh newspapers, both Jewish and non-Jewish leading up the synagogue’s dedication, which add a lot more details about the activities of the day. The members of the Rodef Shulem Hebrew Congregation are making great preparations for the dedication of their new synagogue on Ammon street and from present indications it will be a most successful one. The committee of the congregation who are arranging for the dedication have decided to hold it on March 30, which in the calendar of the Gentiles, is Easter Sunday. Some of the most prominent speakers in the county have been invited to attend the exercises in connection with the dedication of the synagogue and it is the opinion of the committee in charge that several of them will be in attendance. The new synagogue is a pretty little structure and the members of the congregation are very proud of it. The organization has increased considerably lately and new members are being added from time to time. Another interesting ceremony to be held in the church on February 23 will be the completion of the parchments of the Five Books of Moses. These have been in course of preparation for many days and are ready to be finished. The letters which are partly formed in the book will be completed by one of the visiting dignitaries of the church and will then be sewed onto the scroll. One of the plans for the dedication of the synagogue is to have the congregation meet at the home of I.S. Grossman on Dickson street and from there march to the synagogue in a body. 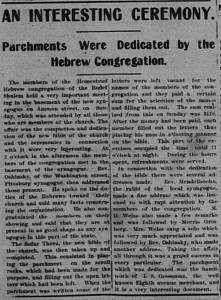 Parchments Were Dedicated by the Hebrew Congregation. The members of the Homestead Hebrew congregation of the Rodef Shulem held a very important meeting in the basement of the new synagogue on Ammon street, on Sunday, which was attended by all those who are members of the church. The affair was the completion and dedication of the new bible of the church and the ceremonies in connection with it were very interesting. At 2 o’clock in the afternoon the members of the congregation met in the basement of the synagogue. Rev. Oshinsky of the Washington street, Pittsburg synagogue then addressed those present. He spoke on the duties of the Hebrews toward their church and told many facts concerning the organization. He also congratulated the members on their showing and said that they are at present in as good shape as any synagogue in this part of the state. The Sofar Thora, the new bible of the church, was then taken up and completed. This consisted in placing the parchment on the scroll racks, which had been made for the purpose, and filling out the open letters which had been left. When the parchment was written some of the letters were left vacant for the names of the members of the congregation and they paid a certain sum for the selection of the names and filling them out. The sum realized from this on Sunday was $119. After the money had been paid, each member filled out the letters thus placing his name in a lasting manner on the bible. This part of the exercises occupied the time until 11 o’clock at night. During the hours spent, refreshments were served. In connection with the dedication of the bible there were several addresses made. Rev. Mendellssohn, the rabbi of the local synagogue, made a fine address which was listened to with rapt attention by the members of the congregation. M. D. Weiss also made a few remarks and was followed by Morris Grinberg. Mrs. Weiss sang a solo which was very much appreciated and was followed by Rev. Oshinsky, who made another address. Taking the affair all through it was a grand success in every particular. The parchment which was dedicated was the handiwork of I.S. Grossman, the well known Eighth avenue merchant, and it is a very interesting document. The Hebrew Congregation Preparing for a Big Time. The Homestead Hebrew congregation held a meeting last evening and decided to have a big banquet in connection with the dedication of their handsome new synagogue which takes place March 30th. The banquet will be held in the Opera house and covers will be laid for several hundred people and it promises to be by far the greatest affair of the kind ever held in Homestead. 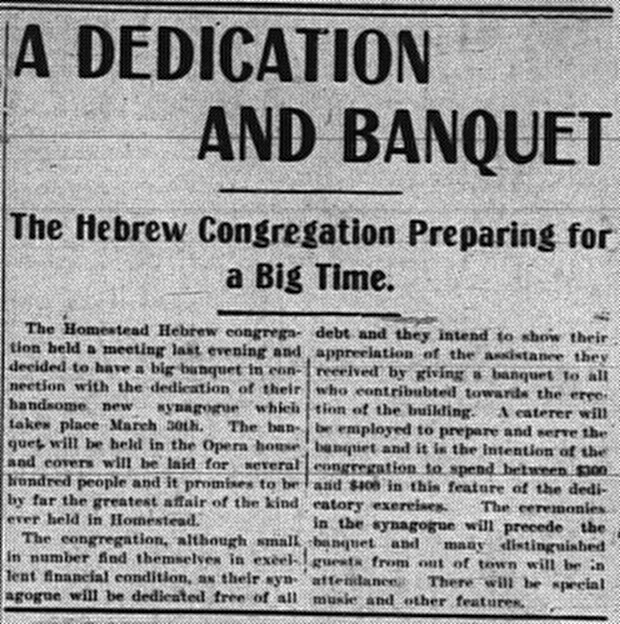 The congregation, although small in number find themselves in excellent financial condition, as their synagogue will be dedicated free of all debt and they intend to show their appreciation of the assistance they received by giving a banquet to all who contributed towards the erection of the building. A caterer will be employed to prepare and serve the banquet and it is the intention of the congregation to spend between $300 and $400 in this feature of the dedicatory exercises. The ceremonies in the synagogue will precede the banquet and many distinguished guests from out of town will be in attendance. There will be special music and other features. For the Dedication of the New Hebrew Synagogue. The Homestead Hebrew congregation held a meeting last evening and completed the arrangements for the dedication of their new synagogue on Ammon street. The ceremonies in connection with the didication (sic) will be very elaborate. It will be held on Easter Sunday, March 30. One of the speakers at the affair will be Dr. Fried, of the Ross street, Pittsburgh synagogue, while another will be Rev Askinsky (sic), of the Washington street synagogue. The choir from the former church, with an orchestra of six pieces will be present and furnish the musical part of the program. After the dedication the members of the congregation will give their banquet in the Fifth avenue opera house. The invitations for it will be issued in a few days. This part of the affair promises to be very fine and covers for 200 will be laid. One of the speakers will be Rev. I. Leonard Levy, who is at present in charge of the Pittsburg Eighth street temple. He is one of the leading divines of the Hebrew church in the United States and the members of the local congregation are indeed lucky in securing him to make an address. Others speeches will be made by some of the officers of the local congregation and the borough officials. OF THE NEW HEBREW SYNAGOGUE ON AMMON STREET. Will Begin at 2 o’clock in the Afternoon With the Assemblage of the Members at the Home of I.S. Grossman–The Program for the Day. 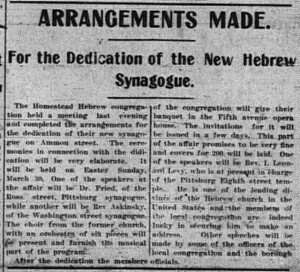 Sunday will be one of the most auspicious days for the Hebrews of Homestead that they ever had, it being the occasion of the dedication of their new synagogue on Ammon street. All of the arrangements for the dedication have been completed and now everyone is ready for it. The ceremonies in connection will be most auspicious and will start at 3 o’clock in the afternoon to be wound up with a banquet in the Fifth avenue opera house in the evening. Previous to the hour set for the dedication the members of the congregation will assemble at the home of I.S. Grossman on Dickson street and will march from there to the synagogue. There will be several distinguished visitors present and everything points to the dedication being a success. Opening the Doors of Synagogue. Hymn by rev. Mendelsohn accompanied by orchestra and choir. Hymn by Rev. Mendelsohn and choir of children. By Rabbi A.M. Ashinsy, of Pittsburg, in German. The Saphorim (Scrolls of Law) are brought in by President and Vice President of congregation. By the reader–the congregation repeating each verse. The bearers of Saphorim make circuit in the Synagogue. The Saphorim are deposited in the ark. Address by Rev. Fried, of Pittsburgh. Hymn by Rev. Mendelsohn and choir. Address by A. Edlis, of Pittsburgh. Addresses by Burgess J.C. Miller, Hon. John F. Cox, Dr. Purman, Wm. McConegly and A.C. Stein. Special prayer for President and Vice President of the United States by Rev. Fried. By Rabbi Ashinsky in English. IMPOSING CEREMONIES IN CONNECTION WITH IT. The Homestead Hebrew Congregation of the Rodef Sholem to Formally Open Their New Synagogue To-morrow–An Elaborate Program. Tomorrow the dedication of the new synagogue of the Homestead Hebrew congregation of the Rodef Sholem will take place and from present indications the affair will be a brilliant one. The committee of arrangements for the dedication, which is composed of B. Hepps, I. Grossman, M. Grinberg, H. Haupt, M.D. Weiss, M. Frankel, N. Eskovitz, B. Gluck, I.S. Grossman, A. Hepps, Joseph Lasdusky, Philip Cohn, Sam Moranz and H. Moskovitz, have every thing completed for the ceremonies in connection with the dedication and they are satisfied that it will be a success. The new synagogue is located on Ammon street, a short distance from the Eighth avenue corner and it is indeed a neat little edifice. It is finished in the best of manner and is something of which the congregation can be proud. The dedication will start early in the afternoon when the members of the congregation will assemble at the home of I.S. Grossman on Dickson street and march in a body to the synagogue. Here the exercises will begin with the opening of the doors of the synagogue. Rev. Mendelsohn, the rabbi of the church, will then lead the hymn “Raise Your heads, O ye dates! and be ye raised while, ye everlasting doors, and let the King of Glory entry.” The orchestra and choir will assist in the hymn. This will be followed by another hymn, “How Goodly are Thy Tents, etc.,” by Rev. Mendelsohn and choir of children. The dedicatory address will then be delivered in German by Rev. A.M. Ashinsky, of the Washing street, Pittsburgh, synagogue. The Saphorim, or Scrolls of Law, will then be brought forth by the president, Joseph Lasdusky, and vice president, B. Hepps, after which the reader will deliver three verses each to be repeated by the congregation. The Saphorim will then be taken and the circuit of the synagogue made, the reader singing, “The Dedication of the House of David.” Then the scrolls will be deposited in the ark during the chant, “Return, O Eternal, to the many thousands of Israel, etc.” Rev. Fried, of Pittsburg, will make an address in the congregation, which will be followed by a hymn, “Hallelujah, Praise the Lord,” by Rev. Mendelsohn and choir. Following this addresses will be made by A. Edlis, of Pittsburg, Burgess J. Clyde Miller, Attorney John F. Cox, Borough Solicitor, William L. McConegly, Dr. John Purman and A.C. Stein. A special prayer will then be said by Rev. Fried for the president and vice president of the United States, after which the closing address and benediction will be given by Rev. Ashinsky in English. This will end the ceremonies at the synagogue. In the evening the members of the congregation will hold a banquet in the Fifth avenue opera house at which A.C. Stein will be the master of ceremonies. Invitations have been issued to many people who are not members of the congregation and indications are that a large crowd will be in attendance. There will be music in attendance and addresses will be made by members of the congregation and others. The menu as prepared for the evening is as follows. Roast al a Homestead. Asaparagus. Import Mixed Cakes. Queen Olives. The reception committee at the banquet will be made up of Morris Grinberg, Joseph Lasdusky, and B. Hepps. Covers will be laid for 300 guests. On Sunday afternoon the Homestead Hebrew congregation Rodeph Shalom will dedicate their new synagogue on Ammon street Homestead, with interesting ceremonies. The committee of arrangements consists of Bernard Hepps, Isadore Grossman, Henry Haupt, M. D. Wise, Morris Frankle, I. S. Grossman, Samuel Heranz, Joseph Lasdusky, Hathan Eskovitz, Henry Moskovitz, Bernard Gluck and Philip Cohn, all business men of Homestead. The congregation is in very good circumstances at present, being almost entirely clear of debt. The new structure was completed a short time ago and cost about $7,000. It is finished in the best manner possible. The congregation of the Rodeph Shalom consists of about 60 Hebrew families and is presides over by Rev. A. G. Mendellsohn, formerly of Altoona. It is expected that there will be a large crowd in attendance at the dedication which will be in charge of A. C. Stein as master of ceremonies. At 2 o’clock in the afternoon it will begin with a procession of the members of the congregation from the residence of I. S. Grossman on Dickson street, to the new synagogue. The ceremonies will wind up in the Fifth Avenue opera house, where a banquet will be held in the evening. At the dedication addresses will be made by Burgess J. C. Miller, Hon. John F. Cox, Hon. Willian McCongely, Dr. John Perman, A. C. Stein, Rev. Fried, Rev. M. C. Ashinsky, Rev. Menellsohn (sic) and others who are members of the congregation. One of the main features of the dedication will be the singing, which will be done by a Pittsburg choir. Homestead Hebrews Have Erected a Pretty Structure on Dickson Street. An interesting ceremony in Homestead today will be the dedication of the new synagogue of the Homestead Hebrew congregation of Rodef Schulem, which has erected a pretty structure on Dickson street adjoining the Second ward public school. The ceremony will begin at 2 o’clock, when the members of the congregation will meet at the resident of I.S. Grossman, on Eighth avenue. They will march in a body to the church, where the ceremonies will start with the opening of the doors. The Rev. C. Mendelssohn, pastor of the church, will perform this ceremony while the congregation will sing “Raise Your Heads, O Ye Gates, and Be Yet Raised, Ye Everlasting Door, and Let the King of Glory Enter.” 8 Another similar hymn will be rendered and the people will pass in. The dedication will be preached by the Rev. A.M. Ashinsky, of Pittsburg. The sephorim, or scrolls of the law, will then be brought in by the president, Joseph Lasdusky, and the vice president, Bernhard Hepps, and will pass around the church […] to reading and singing. They will then be deposited in the ark of the covenant. The Rev. Mr. Fried, of Pittsburgh, will preach, and addresses will be delivered by Attorney John F. Cox, Attorney W.L. McConegly, Burgess J.C. Miller, Dr. John Purman and A.C. Stein of Homestead. In the evening the members will banquet at the Homestead Opera House, A.C. Stein being toastmaster. About 300 guests are expected.